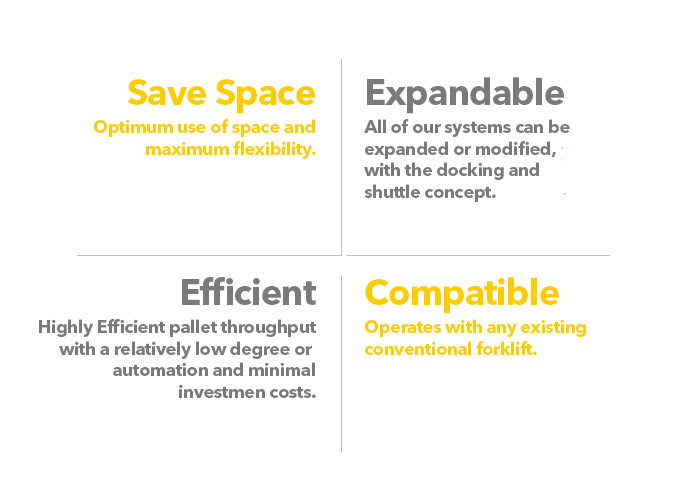 What is Orbiter® Pallet Shuttle? 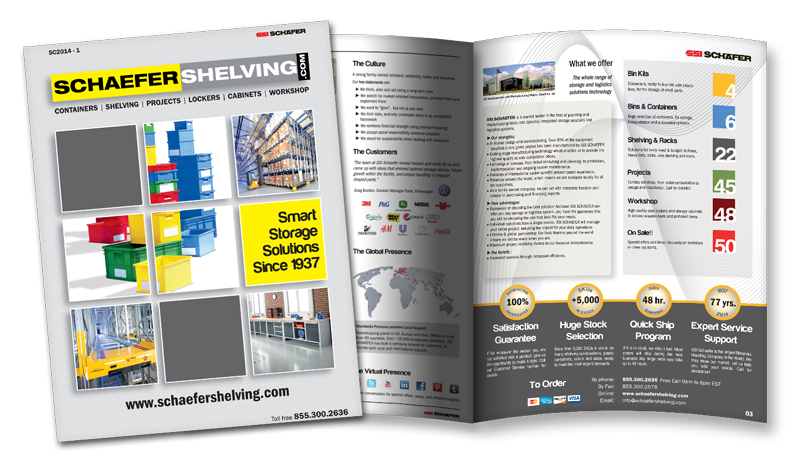 A Pallet Shuttle is an automated storage and retrieval system. 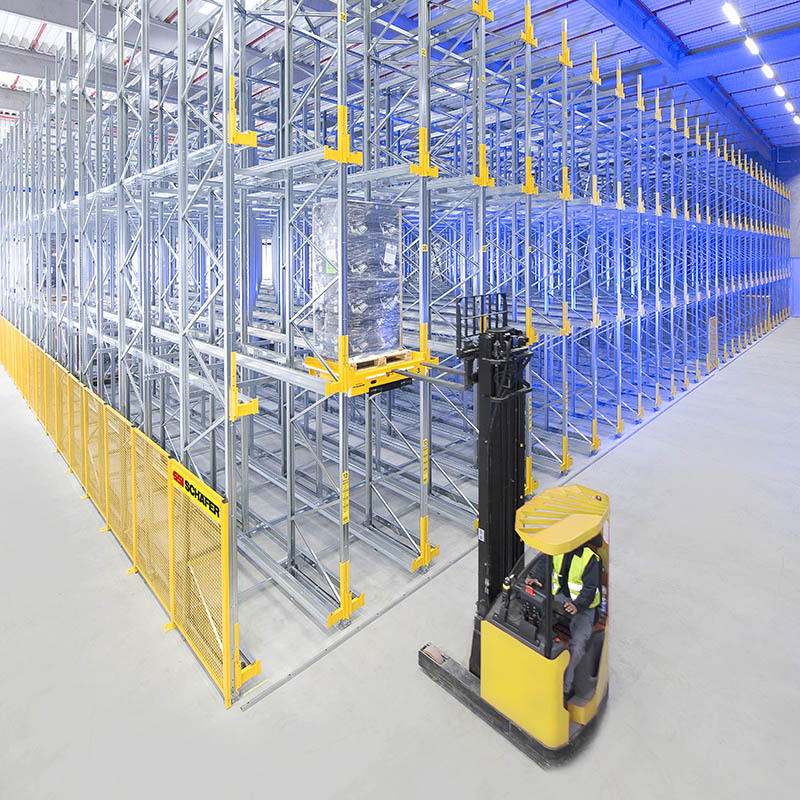 It eliminates the need for forklift trucks to enter the channels, increasing the efficiency, performance and safety of a deep channel storage solution. The Orbiter docking station and the Orbiter shuttle vehicle form a single unit that can be moved throughout the warehouse. 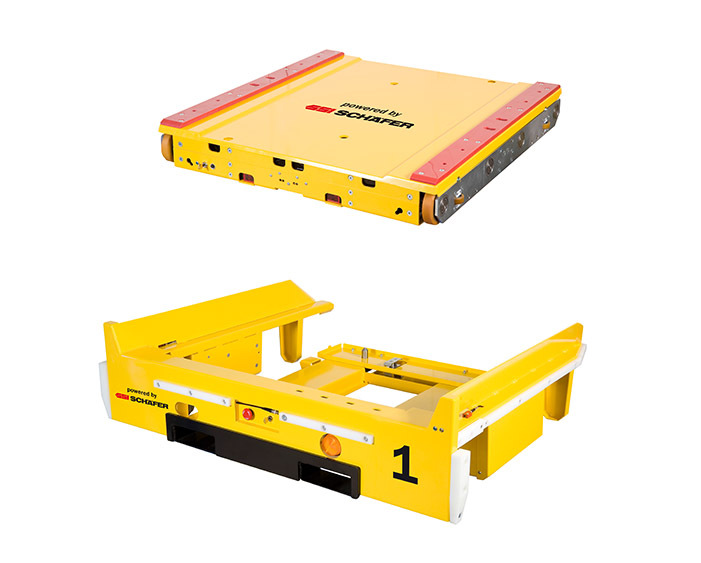 The docking Station is equipped with a centering bracket allowing automatic alignment and positioning of the pallet. 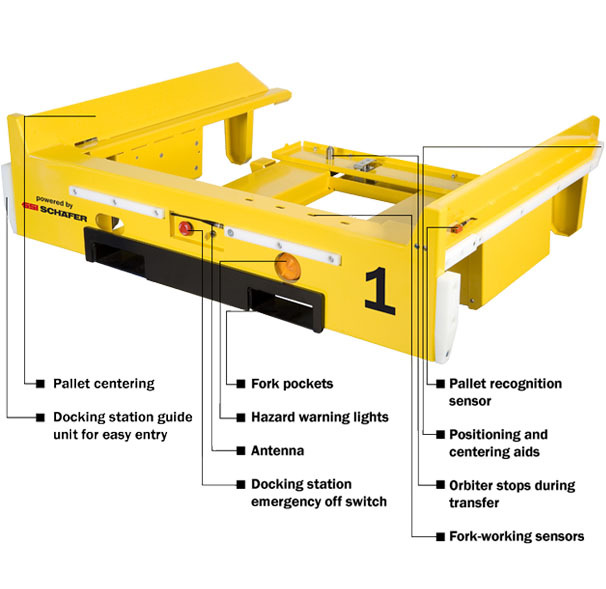 The forklift picks up the docking station with the shuttle vehicle and inserts the unit Into the centering console of the desired rack location. The forklifts then pick up pallets and position them onto the channel rails. 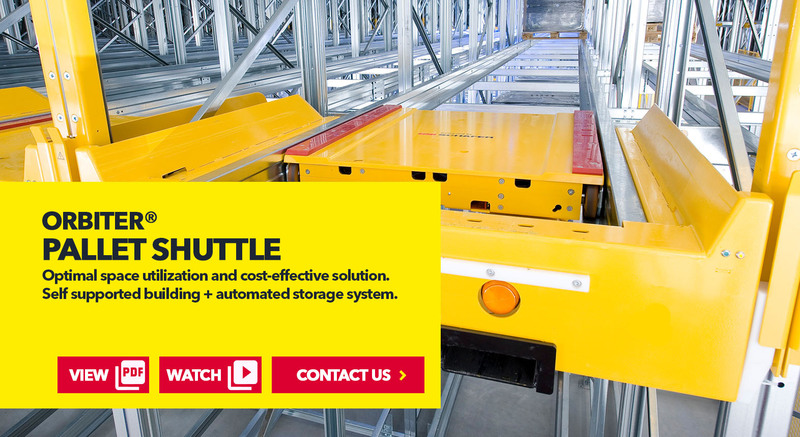 While the forklift driver picks up the next pallet to be stored, the shuttle system conveys the pallet quickly and safely into the desired storage location. The driving commands are communicated to the shuttle vehicle via wireless remote control. Using Radio Frequency (RF), Orbiters provide a more efficient and cost effective solution than traditional racking systems. The Orbiter System is designed for an environment with medium to low SKU counts and a high throughput volume in either FILO (First In- Last Out) or FIFO (First In- First Out) mode. Watch SSI SCHAEFER ORBITER® in action! Powered by "Power Cap™ Technology": Orbiter® is the only pallet shuttle system in the market that does not require batteries to operate which means no charging stations and no downtime, leading to greater efficiency and faster ROI. Up to 50% Reduction in Operating Costs: Reduced operating and property costs thanks to excellent space utilization of the system makes it the number one choice for refrigerated warehouses due to their high electric costs. 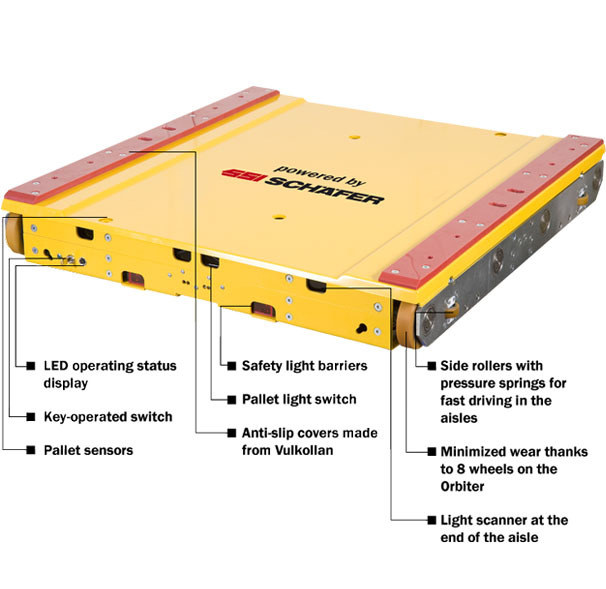 Safe and Accident-Free Working Operation: Equipped with advanced redundant safety systems such as light barriers, pallet sensors, emergency stops, and more.